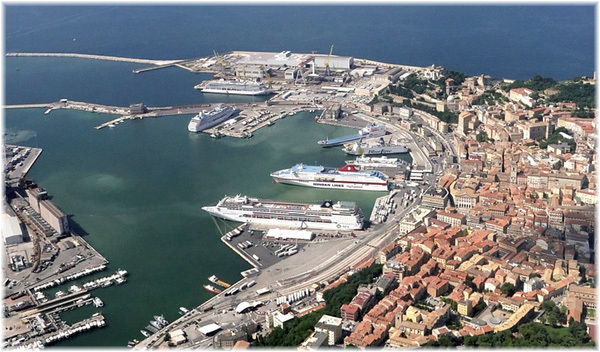 The port of Ancona, Italy, is located in a strategic position. Ancona is the capital of Marche region, a territory rich in history, and extremely various: mountains, hills, and beaches are concentrated in a relatively small territory characterised by a culture made of quality of life, respect for the environment, beauty and solid entrepreneurship tradition. 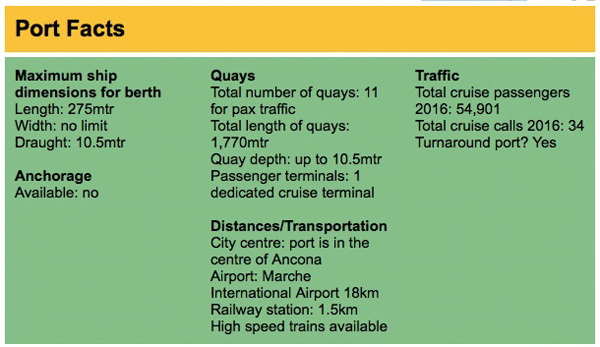 The town welcomes the cruise passengers with its historical centre just few steps away from the cruise terminal. Ancona was founded in the 4th Century BC and the heritage of the Greek, Roman and Byzantine civilizations can be found from the port, with the wonderful architecture of the Trajan arch in the Old port area. The cathedral of the XI century, the church of St. Maria and the Lazzaretto of the Vanvitelli in port represent other expressions of the cultural heritage of the town, while the archaeological museum and the recently reopened art gallery are relevant tourist attractions. In summer 2017 a masterpiece of modern art will appear on the quays of the port: the new fountain of the artist Enzo Cucchi will be an international attraction to experience. For the first time the artist will build one of its worldwide known fountains in a port. The water and the fountain will symbolize the welcoming of the town for all the passengers passing through the port of Ancona. The parks on the hills surrounding the town are ideal places for natural excursions, while the town centre is the place for shopping and relaxation. Close to the town, the Conero Riviera and the natural park offer wonderful beaches and nature. Other famous attractions close to Ancona include the system of caves of Frasassi, the town centre of Urbino, UNESCO World heritage site, and the town of Jesi. 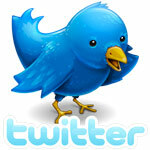 Many other sites wait to be discovered.